What's being teased by Ian Wyatt as a back door into the year's hottest IPO (so far)? In case you’ve been living under a rock, the hot IPO news this year is that both Lyft and Uber will be going public very soon — Lyft, in fact, should hit the public markets for the first time on Friday after setting a price for the IPO tomorrow, and their larger competitor will be watching closely, with plans to join them in listing publicly (and raising money) sometime in the next few months. And it’s going to be a doozy, most likely, it will probably be priced in the $60s and may well soar on the first day of trading if demand is as high as the press coverage indicates. These are huge and unprofitable companies, with arguably no rational path to profitability in the next few years other than “fix prices” or “screw over drivers,” but they are also operators of fantastic and very popular services that almost every urban American relies on to some degree, and they are the biggest “brand names” to hit the IPO market in years. And they’re big — Lyft will likely have an implied valuation of about $20-25 billion depending on pricing, Uber is hoping to go public at a valuation of over $100 billion. And, yes, investors love IPOs. Probably more than they should, given that the real purpose of an “IPO” is usually as much “Employees and early Backers Want to Sell” as it is “We Need Capital for our Amazing Growth Plans,” but we all still remember the go-go days of the late 1990s when getting a piece of a dot-com IPO might give you 500% returns in a week, and there’s something universally appealing about being first. People still line up at the Apple store for the latest model on the day it’s released, and people still want to buy IPOs on the first day. So it’s understandable that newsletters have often found that promising access to “Pre-IPO” shares in exchange for a subscription payment is an appealing enough offer to get possible subscribers off the fence and pulling out their credit cards. We’ve written about these a few times, so I thought I’d update my thoughts by checking out the latest teaser pitch along these lines from Ian Wyatt. Here’s the headline from Wyatt’s “webinar” pitch, where he sells you on viewing his free live presentation… which, I am pretty sure, is going to pitch the same exact “pre-IPO” investments he has touted before. So no, I confess to not having participated in the live presentation… though I have sat through a couple of his similar presentations in the past. So I’m just going to assume that he’s again pitching his Million Dollar Portfolio, as he did with similar “webinar” presentations touting ways to get in early on the Spotify IPO almost exactly a year ago. 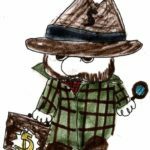 Wyatt is almost certainly going to again be touting the major publicly-traded venture capital funds again — those are, on the exchange-traded side, GSV Capital (GSVC), which is an owner of Lyft shares, and Firsthand Technology Value Fund (SVVC), which is not… and on the mutual fund side, the SharesPost 100 Fund (PRIVX), which currently lists Lyft as its largest holding. 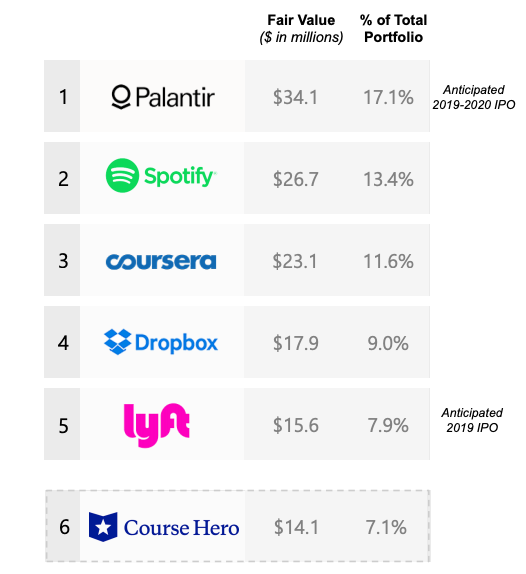 Other likely high-profile IPOs in the near future like Pinterest and Palantir are also holdings of some of these funds, along with dozens of venture-backed companies that most of us have never heard of. GSVC and the PRIVX fund are the most noteworthy publicly-available owners of the higher-profile companies as of now (SVVC doesn’t own Uber, Lyft, Palantir or Pinterest), though that doesn’t mean they’re going to surge higher instantly. These are diversified investment funds, and the returns are not going to be earthshaking for any of them just because of any possible “pop” in the value of Lyft (or whatever the next “hot” IPO is). What does that mean? Well, if it’s about 8% of the NAV and the value of Lyft somehow doubles in the first weeks after going public, that would mean their stake goes from $15 million to $30 million in value. 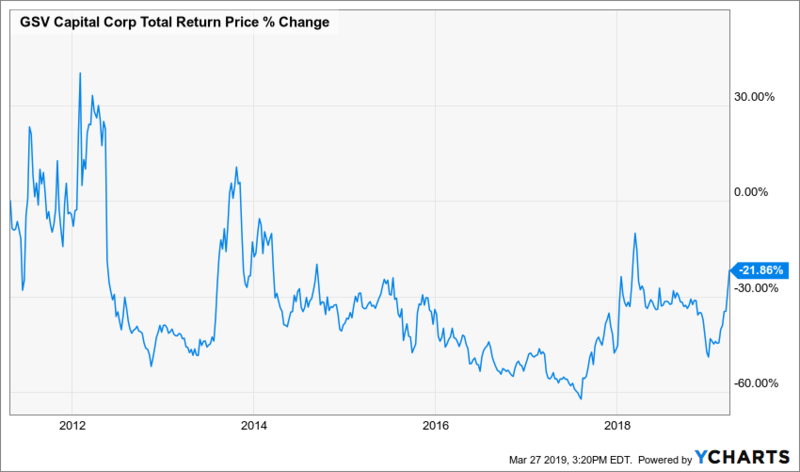 That $15 million is meaningful for a smallish company, the current net asset value for GSV Capital is $195 million (as of Dec. 31), so that would be a 7.5% boost to the fund’s book value per share. That could drive the shares up a little, assuming Lyft sees such an instant surge. 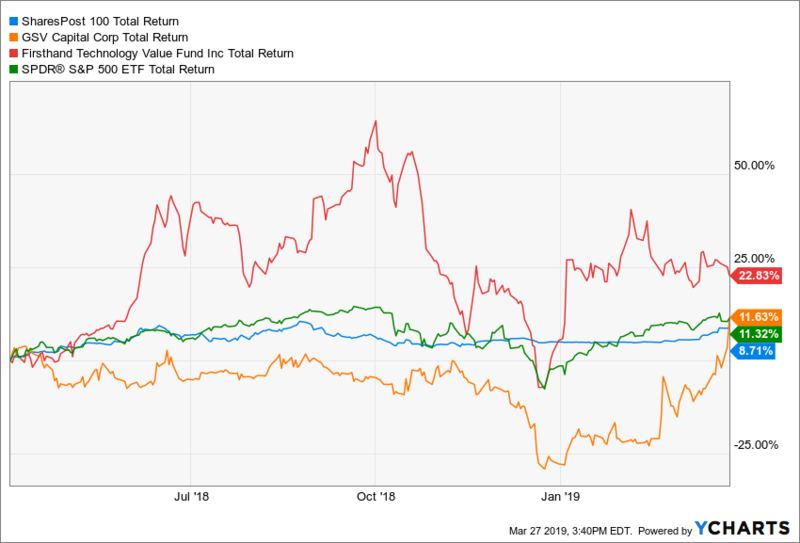 But GSVC is also a fund that trades independent of the net asset value — sometimes they’ve traded at less than half of NAV at times when no one was excited about the IPO market or their “exit” potential, so the bigger difference is in sentiment about GSVC. They went from trading at about 60% of asset value in mid-January to now trading at 80% of book value, mostly because, I assume, investors are enthusiastic about the prospects for IPOs and private market valuations improving again… and probably largely because GSVC is one of the few ways to get exposure to Lyft and Palantir and similar high-profile names. Should you want to get exposure to those names? Well, that’s a different question. The same thing has happened with GSVC and SVVC in the past with the Facebook IPO, then the Twitter IPO, and if you had bought into GSVC back in 2012 because of that enthusiasm and held onto the shares, you would have lost a lot of money buying into previous spikes in the the “price to book” valuation. Here’s the chart of GSVC since inception — price in orange (currently about $8), price/book valuation in blue (currently about 0.8). That’s not just to pick on Wyatt, who has touted this fund many times. I’ve owned GSVC in the past, tempted by huge discounts to NAV, but it didn’t particularly work out well for me, either… but looking at funds like GSVC at huge discounts before a mania emerges about some high-profile upcoming IPO works out a lot better than buying during that mania at much higher prices. If you want a lot of exposure to Lyft, just buy LYFT shares — you will likely pay a lot more than GSVC did, but you won’t also be saddled with their management costs and the 30 companies they own that you don’t care about. Or better yet, wait it out and see if Lyft shares collapse in six months once the lockup expires and insiders start selling, or whenever people move their profit lust on to Uber or the first wave of ugly news hits the shares, it’s very rare for the IPO price to be the all-time low for a stock, there are almost always opportunities to buy during periods of much lower enthusiasm. And how about the SharesPost 100 Fund (PRIVX)? That’s structured as a mutual fund, so it offers shares and redemptions (which are limited) only at the NAV, so you can’t ever buy in at a discount (or premium), and it’s far less liquid than GSVC. They do, however, have a big investment in Lyft — the fund has about $11 million worth of Lyft shares in its portfolio as of the end of 2018 (Annual Report here), which tallies up as about the same percentage exposure as GSVC, roughly 7.5% of the fund. Returns will not be as dramatic up or down as GSVC, most likely, but the impact on NAV of the Lyft IPO should be about the same for both. Neither of these investments is going to bring you a life-changing payday, and both are expensive and high-friction investment funds in what is still a fairly opaque and illiquid market for mostly large and established private venture-funded companies. It’s an interesting asset class, but I wouldn’t look to these funds for IPO-based riches in any given stock or any given year. looking into all those private telemedicine companies got me thinking about that venture capital fund I put a small amount of money into a few years back… we haven’t gotten teased as much recently about these kinds of “buy the unicorns before they’re public” funds, probably mostly because they’ve generally been disappointing, but I thought I should at least take a look at it for you. That fund is the Sharespost 100 Fund (PRIVX), which I believe is still the only mutual fund that focuses on pre-public companies — their goal is to invest in stocks that are in the final runway to going public or otherwise generating an “exit,” ideally within a few years of an IPO. They are an “interval” mutual fund, so you can buy and sell at net asset value (NAV), but there is no daily liquidity — you can only sell your shares once per quarter (and there are some limitations on even that), and they also, probably not surprisingly for a small venture capital fund, have a very high expense ratio — so those two negatives are most of the reason why I sampled it with just a small investment back in 2015. The point is, the plan was to invest in these “mature startup” companies after they had established some bona fides (like good revenue, or a hope of profitability), and ride the closing of the valuation gap from a few years pre-IPO through the IPO process and perhaps for a couple years post-IPO, realizing the gains. That might end up being a dumb idea. 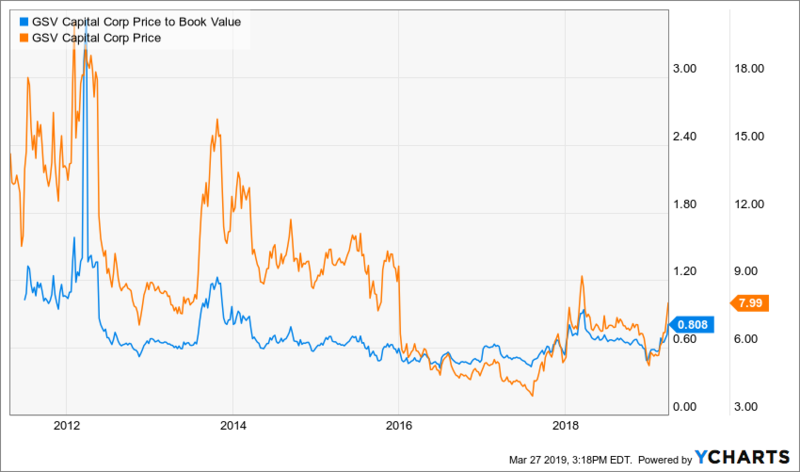 I don’t know if there IS a valuation gap anymore, given all the money chasing those caribou (yep, I’m settling on caribou), but there have certainly been some “wins” in the PRIVX portfolio — DocuSign (DOCU) now carries an $8 billion valuation after going public early this year, and that was and remains a PRIVX portfolio company, currently their largest holding. Lyft is continuing to grow in the shadow of Uber and is in a race with them to be the first ride-sharing IPO, though some leaked info on their financials indicates that the 70/30 market share split continues in some key markets, and we’re not particularly close to the price war between the two settling down (and, of course, both are losing buckets of money, most of it contributed by shareholders eager to “get in early”). The returns for the SharesPost 100 Fund during these past few years of “caribou” mania? They’ve been weak… but positive. 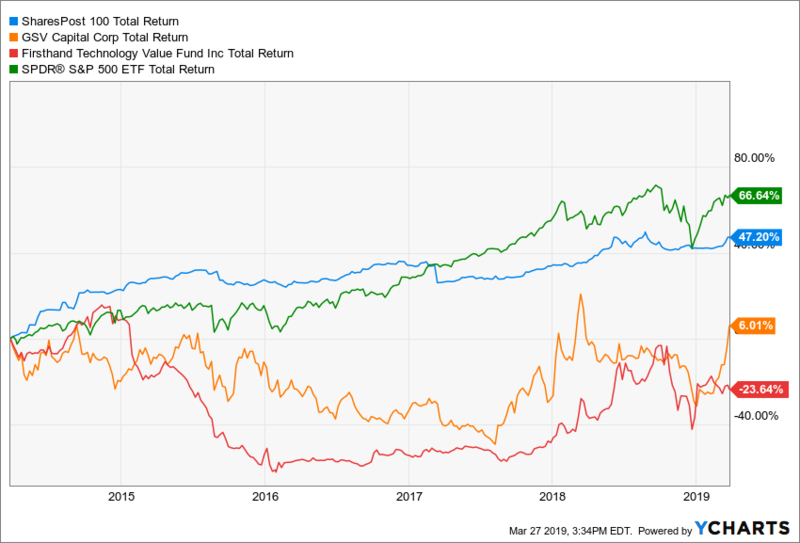 The fund has come respectably close to matching the S&P 500 on a cumulative total return basis (9% to 11.5%, so the returns of PRIVX were about 20% less than those you would have gotten from an index fund)… but there’s also a sales load that most investors would have paid of 5.75%, so the return after that is weaker still, 7.5% annualized since inception. Still positive, but trailing the S&P by a lot — and, thanks to the huge outperformance of the FANGs and similar large tech stocks, trailing the tech sector by a ton (the S&P Technology index returned something close to 20% annually over that time period, and most of the startups in the fund would be called “tech stocks”). That’s fine IF this is an asset class that can generate steady returns — if “harvesting” the valuation bump that companies get late in their lives as private companies and early in their publicly traded lives is a sustainable thing and doesn’t generate volatile returns, you don’t need to beat the market. The strategy of looking for more mature startups doesn’t give them a great chance of coming up with real 1,000% blockbusters, so they do need consistency if they’re not going for the “1 in 100 will make us filthy rich” strategy… and it’s probably too early to be certain about whether they’ll have that, though the past year or two has definitely seen improvement. What does that “no likely blockbusters” mean? Well, it’s part of what turns off some investors, I imagine, since “venture capital” makes one think of investing in Mark Zuckerberg while he was still coding in his dorm room. SharesPost’s strategy would have had them buying Facebook a few years before it went public at maybe $20 a share, not buying when Mark Zuckerberg was dropping out of school and the shares that folks like Peter Thiel were buying were some tiny fraction of that amount… buying Facebook at $20 would obviously have been delightful, but a few years after the IPO that would have been just a 200% return or so, not an earthshaking number. My major concern about the SharesPost 100 Fund back when I put a minimum amount into the fund and was talking with the fund managers back in 2015, was that I didn’t know if they’d be able to scale up and invest in attractive companies at reasonable prices — there’s clearly too much money flowing into venture capital now and inflating prices, but that was also true (to a lesser extent) a few years ago, and this little mutual fund can’t offer the full support that major VC firms do in terms of supplying board members and management expertise and the other “soft” benefits that venture capital investors provide for their portfolio companies to help them along. They aren’t the first call a company makes when they need money. So what to do? Things look quite a bit better for PRIVX than they did a year or so ago, frankly, mostly because DocuSign and Zuora went public as pretty big holdings, and were well received. I don’t mind still having that minimum amount invested with PRIVX, I still find it interesting to review their reports and look at the companies coming up through their system… but I wouldn’t make it a meaningful part of my portfolio. The expense is just too high — the annual expense ratio is 2.5% until next May, when their fee waiver expires and they are likely to bump it up to 3.75%, which is a huge bogey to overcome over the long term. That’s an understandable expense ratio given the costs of vetting and monitoring private companies, but it really just goes to emphasize the point that PRIVX may just be too small to be an efficient venture capital investor… they are getting closer, but they aren’t quite pulling enough capital in to cover their costs or give them huge influence in Silicon Valley (they have about $135 million in assets under management now, up from $20 million when I was first writing about them, so they’re moving in the right direction… partly by adding some additional share classes to attract more investors). And how have their investments gone so far? They have had a bunch of “exits” as companies went public or were acquired (though they haven’t exited all the public ones), and most of those have been profitable. And on a surprising note, at least for me, they have been able to invest most of their capital, which is good — short term investments were only about 20% of the fund as of the end of June. The total fair value of the portfolio (which is either their estimate of the fair value based on most recent funding rounds, for the private companies, or the public value for those that have gone public, like Spotify and Docusign) is about $121 million, and they have invested a total of $88 million, so that means they’ve grown their portfolio by about 30% over the years (not annualized, that’s total — the earliest investments were made in the fall of 2014) — the biggest gainers have been DocuSign, Zuora and Lyft at this point, and those are also among the largest and most liquid investments (Docusign and Zuora are public, Lyft will probably be public by next year and has lots of active private shareholders and a good secondary market trading those shares). The performance of the fund has been worse than that because some poor performers have cycled out of the portfolio, and because building these positions has generally been slow and piecemeal work — which means a lot of their older holdings started out very small, and that the large cash position in the portfolio also depressed returns. And that’s about all I’ve got for you today, dear friends. Go out and chose those Lyft shares into a hoped-for pop on the first day if you like, or beg your broker for an allocation at the IPO price, but if you want to invest in publicly available venture capital funds, well, be prepared for spikes of enthusiasm around brand-name IPOs married to long periods of bad performance… and don’t count on beating the S&P 500. Have any thoughts on Lyft or venture capital investing? Actually sit through the Wyatt presentation and think he had something new to entice us? Let us know with a comment below. 38 Comments on "Can you really “Buy Lyft Stock Before the $23 Billion IPO?”"
So is (GSVC) a stock to buy before it’s public? Not for me, but lots of people have been buying it in the past month or two — with the upward price pressure probably mostly caused by enthusiasm for LYFT, though we won’t know for sure until we see if GSVC drops back down again a few weeks or months after the LYFT IPO… as it typically has after other high-profile IPOs of companies that it has in its portfolio. You get Travis’ actual buys & sells if you become a Premium member, and it’s much cheaper than most newsletters (particularly if you do the Lifetime membership). Got there but didn’t give a price or type of premium options I can choose. Unless I fill in the forms and create a password. Is that about right? We only have one level of paid membership — just different prices for different time periods ($7/mo, $59/yr)… sorry for the confusion. Travis did you forget the $329 for Platinum membership (one-time payment) for as long as this site exists? There is an ETF called IPO. Might be worth mentioning even if it isn’t tyhe one being touted here. Yes, the Renaissance IPO ETF (IPO) — that is generally a “buy at or near the IPO, hold for a couple years” ETF. They won’t own Lyft shares yet, but do have still a lot of fairly recent IPOs that people watch, like SPOT, OKTA, ZZ and PAGS. Those recent IPOs, particularly some of the cloud names, have helped the IPO ETF to outperform the S&P over the past few years, though with a lot of volatility (and IPO had a terrible 2015 before that, so the outperformance is, of course, not at all reliable). If you ride the craze then that may not be such a bad idea as long as you know when to get off. I have made so decent money on IPOs in the past. Lyft look’s like a good bet considering how much money has been thrown at it. Great synopsis on Lyft IPO and impacts on existing shareholder funds. However, it is relevant to note that Rakuten, a Japanese conglomerate is the major investor in LYFT and should be a much better and safer opportunity to invest in LYFT. Rakuten shares are listed under symbols RKUNF and RKUNY. Excellent point, should have mentioned Rakuten — they own about 12% of Lyft and have clearly gotten a boost from that in recent months as well. Absolutely!! And, now, that GSVC has tumbled roughly 16% since its pre-IPO LYFT high of about $8.35, how does Ian’s misconception, misrepresentation and misinterpretation of reality strike you? It’ll be interesting to see and hear how he tries to explain things away and recover and what sort of spin he puts on “buying pre-IPO shares” of Uber and Palantir when/if they actually come to market. At least, it should be interesting and entertaining! Again, Travis’ astuteness prevails and Ian’s apparent unreliability is accentuated! Caveat emptor! IEP has a nice investment in Lyft and Carl Icahn knows how to make money. Yes, Lyft has been pretty liquid for a while and has a bunch of backers who might benefit now, though IEP has a lot of larger bets it’s levered to. GM also owns LYFT shares, as do some Chinese and Saudi backers, including, indirectly, Alibaba and Tencent through Didi of that stake is still held (haven’t checked lately). And, IEP also pays a hefty 10.8% dividend! Looks like Carl Icahn (IEP) sold his LYFT shares before the IPO… might have been good timing, we’ll see. So those initial investments are also referred to as “Shares”? Maybe that is what was throwing me off. And about my statement: “So for all the fervor over IPO’s, they would seem to be out of reach of the average American investor, is that a fair statement?”, would you agree? Because again, the bar set by the brokers seems awfully high for the average investor, unless Fidelity is just worst than most. Yes, access to IPOs at the offering price is reserved for the most profitable clients. And usually there aren’t enough shares for even those folks to get what they want. At least for the popular ones. And private companies are divided into shares, just like public ones. Often venture investors get a different class of preferred shares that give them extra rights, or super-voting shares like many founders reserve for themselves, but it’s still just dividing a company up into little pieces. What are your thoughts on Jim Kramer’s concern/hypothesis that all these new IPO’s will create an excess of supply and send the whole market down? Is that part of the reason you’re happy with your reduced faang exposure and continue to hold hedges or is it not as big of a deal as he makes it out to be? That seems pretty silly to me. The market has shrunk over the years as private companies have gotten easier private funding, and adding even a couple hundred billion worth of new public companies strikes me as more of a rounding error compared to the global value of stock markets. Certainly might impact perception or sentiment, though, and I’m sure Cramer has more expertise evaluating market sentiment than I do. I am amazed these guys can make living from this kind of “idea” these days. We see more rick than reward in this IPO anyway. It’s not even clear what their dividends have been; anyone with insight? I’m a member of Crowdability, which I’m sure you know is a Pre IPO/ Venture Capitol Company. Last night I watched their Marijuana Millionaire Summit. $1495 per year for members. They were teasing a Pre IPO small company calling it their Trillion Dollar Marijuana Monopoly. Starting to get tired of the BS from all of these companies. Travis, I wanted to see if you had any info on this company? Prefer to buy the stock Lyft straight out. I went through this fund with FB. Weak returns. Management fees too high too. Not my cup of tea. It was crazy to start with. I am glad I followed my rationale and didn’t buy into it. Who knows, maybe someday it will be profitable and I might miss out. Thanks Travis. Would companies like LFYT be able to survive and have an IPO if interest rates where not so low? How can they finance so much debt? Originated as a "real money" $100,000 portfolio (called "Wyatt's 100K Portfolio" at the time), mostly focused on "steady and reliable" ideas that generate income through dividends. Rating: 1.5/5. From 4 votes. What’s Wyatt’s “iPolice App” to stop shootings? What's being teased for Wyatt's upcoming "webinar" pick? Ian Wyatt teases that "Walmart Quietly Plans New IPO to Crush Amazon" -- what's he talking about? Wyatt’s “Unconventional IPO” — CEO Invests $25 Million to Start New Energy Company? Ian Wyatt pitches "Freedom Drillers" after the Iran news.... Can you really buy into a South Texas oil producer before it goes public? Is it worthwhile? Ian Wyatt pitches "secret IPO" investments that let you buy private companies before they go public -- what are they?